As Western communities strive to develop sustainable, diverse economies that are less tied to the boom and bust cycle of extractive industries, outdoor recreation offers a promising path to prosperity. In searching for a new home, Outdoor Retailer shined a spotlight on an important issue: Not all Western states are equal in how they recognize and foster the outdoor industry. Some states, such as Colorado and Montana, have adopted pro-outdoor policies that protect public lands and promote access. Other states, such as Utah, have pursued policies that seek to sell off public lands, putting their thriving outdoor economies at risk. States ignore the outdoor industry at their peril. With more than 144 million Americans across the nation—nearly half of the U.S. population—participating in activities such as hiking, fishing, skiing, rafting, and biking, outdoor recreation is big business.5 And it is growing. Outdoor Industry Association (OIA) recently announced that the outdoor recreation economy generates $887 billion in consumer spending annually and employs 7.6 million people.6 For context, that is more than Americans spend each year on pharmaceuticals and fuel combined. This report analyzes the 11 continental Western states in order to identify where smart policies are fostering outdoor recreation as well as where the outdoor economy is full of potential but is stifled by state policies and rhetoric. The report also provides a menu of policies that states could adopt to further support the outdoor recreation economy. Encouraging growth in this sector can help states diversify their economies, strengthen rural America, and support healthier communities. The scorecard looks at four categories—public lands recognition, outdoor recreation funding, access, and getting youth outdoors—in order to provide a profile of outdoor recreation in each of the 11 states. While no scorecard can perfectly capture or compare the outdoor recreation economies of Western states, as they each have unique geographies and varying economies, this analysis looks at a diverse set of indicators in order to develop an overall picture. The sections below provide more detail on the analysis’s methodology. The idea of seizing and selling off public land received national attention at the beginning of 2016 with the armed takeover of the Malheur National Wildlife Refuge in Oregon.7 Policies that promote the disposal of public lands are harmful to the outdoor recreation industry, which depends on public lands remaining public. As a result, this category includes a comprehensive look at both the pro- and anti- public lands bills introduced or passed by the states’ legislatures since the start of 2016.8 Positive public lands bills might include creating a Public Lands Day or affirming a state’s commitment to protecting public lands.9 To account for the dangerous rhetoric of legislators who propose selling off public lands, the scorecard tracks proposed and implemented state policies as well as those policies that have already passed into law. Because this category aims to measure both pro- and anti-outdoor recreation rhetoric, resolutions are included. The analysis also considers whether a state has an office of outdoor recreation that is separate from each state’s department of parks, recreation, and wildlife. When an office maintains a special focus on fostering outdoor recreation that goes beyond the duties of a department focused on managing parks, it helps tap into the economic potential of this sector. The size of the state’s outdoor economy. Using new data from OIA, the scorecard analyzes the size of the outdoor economy in each state as a function of the state’s overall consumption expenditure.12 This helps to demonstrate the degree to which the outdoor economy is thriving in a state; it is also an indicator of policies that encourage growth in the outdoor recreation sector. In addition, the scorecard introduces new geographic information system (GIS) data in order to calculate the distance—in time—that the average resident in each state lives, by vehicle, from an outdoor recreation access point.14 This is a good proxy for how easy the state makes it to visit the great outdoors. The scorecard below shows how each of the 11 states performed across the four categories analyzed and assigns a letter grade to each. Montana scored the highest, while Utah scored the lowest. A more detailed list of sources, methodology, and score breakdowns is available in the appendix. Montana received the highest score, with its actions to improve access going above and beyond what most other states have sought to implement. Although the Center for American Progress’ study finds that Montana has one of the higher mean times to an access point—nearly six minutes—the state has clearly recognized the issue and moved to correct it. It has also hired a public access specialist whose position is housed in the Montana Department of Natural Resources and Conservation and whose job is to “troubleshoot specific issues preventing full public access to public lands.”17 Montana is the only state in the West to have this unique position. The state also has four bills moving through its legislature intended to help improve access, and Montana has the gold standard for stream access laws currently on the books.18Additionally, the state has seen far more pro-public lands legislation in the past two years than land sell-off legislation, including the introduction of a bill to create a Montana Public Lands Day and another to study the economic effects of outdoor recreation in the state.19 All of these components work to support the state’s outdoor recreation economy, which makes up more than 14 percent of Montana’s consumer spending. However, the state has had five land seizure bills introduced in its legislature in 2017 alone, perhaps a reflection of the lingering effects of the 2016 armed takeover of the Malheur National Wildlife Refuge in southeastern Oregon. These bills create an environment of negative rhetoric toward public lands and could have a negative effect on outdoor recreation in the state. Nevada has a lot of room to improve its pro-outdoor recreation policies. Although the state does technically allow public access to its state trust lands, it sold most of them off before the 1900s.37 While this is not great news for access in Nevada, this lesson ensured that, when other states were formed, the federal government required better management of these lands for the benefit of all state citizens.38 For Nevada, further pursuit of proactive access and youth outdoors policies and legislation could even further boost the state’s resonance with the recreation economy. Idaho ranked seventh on the scorecard due to a lack of defined government infrastructure supporting the outdoor recreation economy as well as a sizable number of public lands sell-off bills introduced in the legislature over the past two years, including one bill that would completely outlaw new federal public lands in the state.39 The state does not have a specific office or commission for outdoor recreation, nor does it have a state mechanism to fund improvements in outdoor recreation. One thing Idaho does well is provide access to public lands; in fact, it scored the highest of any state in that category. The state’s streams are open to the public for any recreational purpose, and, in March, the governor signed a bill that will use revenue from increased hunting and fishing license fees to increase access.40 Outdoor recreation makes up a whopping 14.6 percent of the state’s consumer spending, and with some additional fostering, it could add even more value to the state’s economy. Over the past two years, New Mexico’s state legislature introduced a number of bad public lands bills that threaten to inhibit the creation of new national monuments or wilderness areas in the state.41 Furthermore, the state does not provide concrete funding mechanisms to promote outdoor recreation or public lands, and it has one of the highest mean times to the nearest outdoor recreation access point: slightly more than eight minutes. Wyoming’s lack of any clear recreation or public lands funding mechanism, compounded by its six public land sell-off bills in the past two years, caused the state to rank toward the bottom. Wyoming did have some positive legislation. For example, it honored the federal Every Kid in a Park pass in state parks and introduced a new outdoor recreation task force.44 However, the state still has room to become a better steward of outdoor recreation in nearly every category.45 It is worth noting that outdoor recreation makes up a huge percentage of the state’s economy: nearly 24 percent of consumer spending. If Wyoming takes action to the create stronger access laws, and commits to dedicated public lands funding, it could provide even more support to this sector. Arizona ranked 10th on this list with an overall score of zero. With five public land sell-off bills introduced or passed in the past two years and low scores across all categories on the scorecard, it is clear that Arizona has not done much to attract new economic opportunities for outdoor recreation. The state has had small victories, including a bill signed by Gov. Doug Ducey (R) in March 2017, which extended the life of the Arizona Outdoor Recreation Coordinating Commission through 2020.46 Yet progress seems to have stopped there. Although the state does provide funding for outdoor recreation, it does not have a constitutional amendment that makes the funding permanent. The state does not have any clear policies in place to foster youth in the outdoors or environmental education programs. It also does not have an office of outdoor recreation or a policy that dictates access to streams. Arizona has plenty of room to take action in order to increase its outdoor economy and boost an outdoor industry that currently accounts for 9 percent of the state’s consumer spending. 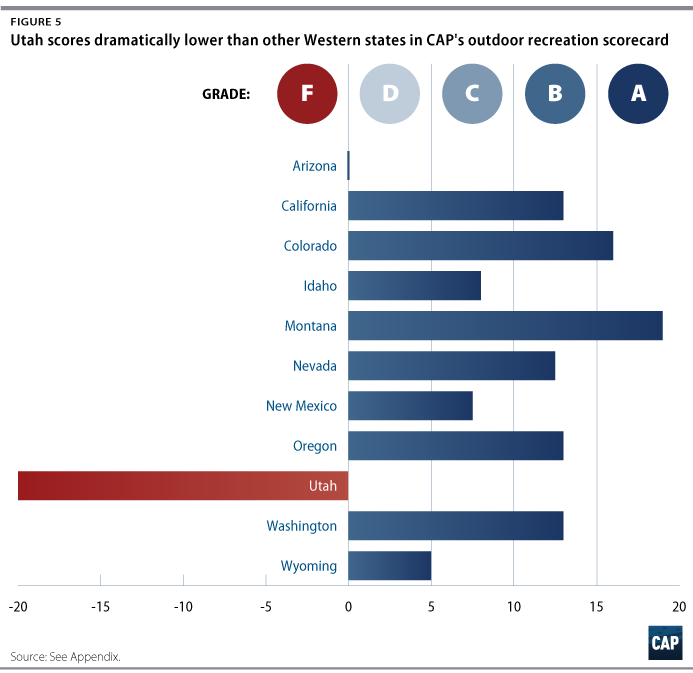 Utah ranked last on CAP’s scorecard. This is somewhat unsurprising given that the Outdoor Retailer show recently left the state over its antagonistic policies toward public lands. What is most noteworthy is the dramatically low score that Utah received compared to that of every other state, largely due to these bills. Thoughtful, innovative policies to strengthen public lands and increase access for all Americans are critical for the outdoor recreation economy. The following is a menu of policy options that states could adopt to boost this growing sector. Since public lands serve as such big economic drivers for local economies, states should take steps to ensure that they are properly recognized and celebrated. Progressive state-level policymakers have offered many of these policy ideas in a proactive attempt to fight back against dangerous rhetoric working to seize, sell off, privatize, or otherwise dispose of public lands. Rather than ignoring the extreme faction of decision-makers that wanted to seize national public lands, the Colorado state legislature took a more proactive approach. In 2016, Gov. John Hickenlooper (D) signed a bill proclaiming that, each year, the third Saturday in May be recognized as National Public Lands Day.50 Public holidays can be helpful tools to convene stakeholders around a common cause, to spur new ideas and initiatives, and to shine an annual spotlight on the state of public lands. In 2013, Utah kicked off what has become a growing trend: creating an official role in the state government for outdoor recreation.51 Utah’s Office of Outdoor Recreation was soon followed by an Office of Outdoor Recreation in Colorado as well as a senior policy adviser for outdoor recreation and economic development in Washington state.52 Now many other states—including Oregon, which passed a bill earlier this year—are following this example.53 By giving special policy attention to the growing industry, these states are recognizing outdoor recreation’s importance to both the economy and the well-being of state residents. In 2015, Washington state secured funding to do an in-depth economic analysis of its outdoor recreation. Importantly, this study provided both county- and congressional district-level data.54 When communities are faced with public lands planning decisions, having this level of local data can influence land use planning and demonstrate the incredible economic power of public lands and outdoor recreation. Unfortunately, most states do not have permanent funding sources to maintain and provide access to state public lands. However, there are several strong examples of public lands funding in the West as well as creative ideas that have been introduced in state legislatures. The Great Outdoors Colorado program takes a portion of the state’s lottery proceeds and dedicates the money to “protect and enhance Colorado’s wildlife, park, river, trail, and open space heritage.” 55 Not only is this a dedicated funding mechanism built into the program, but it is also a constitutional amendment, which makes the funding more secure in the face of shifting politics, ensuring that public lands in the state have adequate resources. Not all states are equal when it comes to prioritizing residents’ access to state lands for outdoor recreation. Below are policy ideas that increase the lands available for recreation. Idaho has also made streams and rivers very accessible to the public. According to Idaho statute, public access is allowed on navigable waters, the definition of which is broad and allows access up to the high-water mark.65 The law also allows for the crossing of private property if an obstruction prevents someone from continuing along the river or stream. Many states’ laws do not have such a focus on access or are ambiguous in that they remain untested and may deter anglers or other outdoor recreation enthusiasts from participating in watersports. Encouraging and supporting more people to appreciate and participate in outdoor recreation—be it new communities or new generations—is an important part of fostering this growing economy. Nearly half of U.S. residents participate in outdoor activities, and while that may seem an impressive number, it means that more than half of the population is left out. Increasing participation is good for the health and well-being of communities, and programs that cultivate the next generation of outdoor stewards could help close the participation gap. The following bills and programs encourage kids, families, and other members of the community to experience and learn about recreation and the outdoors. The No Child Left Inside concept was born out of the concern that children across the nation were not spending enough time outdoors, a trend that author Richard Louv termed “nature-deficit disorder.”73 A number of federal No Child Left Inside bills have been introduced with the goal of improving environmental literacy, but state-adopted bills, proclamations, or programs relating to No Child Left Inside vary widely.74 Both Oregon and Washington have passed state No Child Left Inside bills.75 Oregon’s bill created an Environmental Literacy Plan, while Washington’s created various grant programs to get kids outside. States across the West are not equal when it comes to policies that promote or hinder growth of the outdoor economy. And while some have made more progress than others, it is clear that each of the states analyzed for this report could take steps to improve outdoor recreation. There is certainly a strong incentive to do so. After receiving bids from multiple states, the Outdoor Retailer show found its new home in Colorado, a top-scoring state for outdoor recreation.80Each year, as the industry assembles in Denver, millions of dollars will pour into Colorado’s economy, and the state will continue to solidify its reputation as pro-recreation, attracting visitors, residents, and businesses alike. As Western communities strive to develop sustainable, diverse economies that are less tied to the boom and bust cycle of extractive industries, outdoor recreation and tourism offer promising paths to prosperity. By adopting successful policies from neighboring states, all states can strengthen their public lands systems for the benefit of their residents and local businesses. When it comes to the booming outdoor recreation economy, there is no reason for any state to be left behind. Nicole Gentile is the deputy director for Public Lands at the Center for American Progress. Jenny Rowland is the research and advocacy manager for Public Lands at the Center.